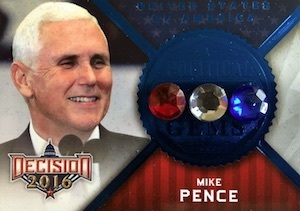 Decision 2016 Series 2 is a follow-up to the original Decision 2016 set. The popular Series 1 product featured an early snapshot of the '16 presidential election right around the point that things were heating up. 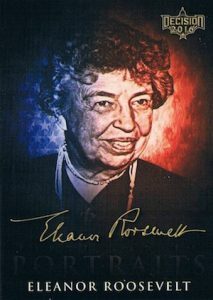 Building on that foundation, Series 2 brings collectors an updated look at the political scene that is much further along for the Republican and Democratic frontrunners. Only found in hobby format, each Series 2 box includes two hits. Created by Brian Wallos, president of the Benchwarmer product line, Decision 2016 Series 2 sticks with the same basic formula that made Series 1 a hit with collectors and in the mainstream news. 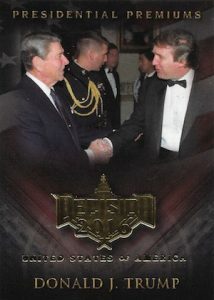 Rick Klein, card collector and ABC's Political Director, is a fan, and The Atlantic even ran a detailed story on Wallos and the comprehensive card set. 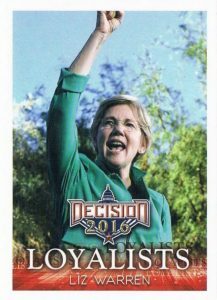 While political cards are not a new concept in the hobby, Decision 2016 is one of the only instances of a full-fledged political set with widespread distribution. Coming as no real shock, Decision 2016 Series 2 relies heavily on official party nominees Donald Trump and Hillary Clinton. Of course, this also extends to their running mates, Mike Pence and Tim Kaine. Building on the Series 1 base set are High Number Base cards that fall 16 per box. 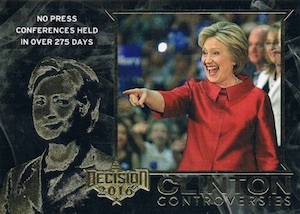 Regular inserts include a continuation of Candidate Portraits and Trump Under Fire, each falling four per box, as well as new options such as Clinton Controversies (3 per box). 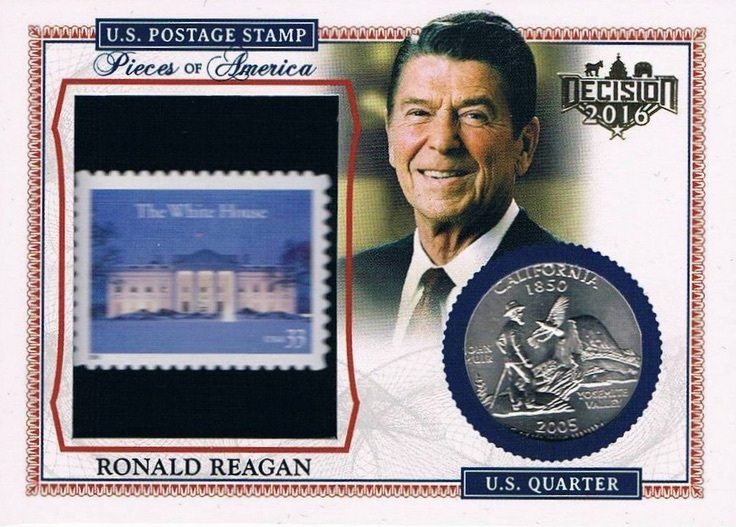 Letter Card inserts return at a rate of one per box. Listening to collector feedback, Decision 2016 Series 2 guarantees two hits per box from quite a few choices. 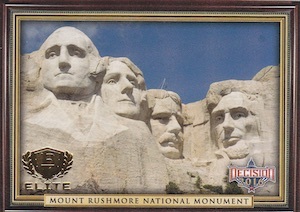 This includes the popular Cut Signatures (1:4 boxes) along with a Dual version. 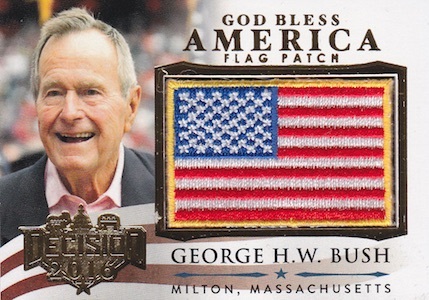 Other premium pulls include manufactured relics like Gems, God Bless America (GBA) Flags, and Super Flags. Money cards feature authentic shredded currency while Pieces of America pairs a real stamp and coin. 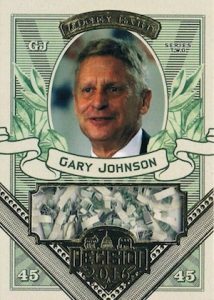 More options include Elite, President Premium and Party Pals Booklet, while Sketch cards offer an artist's rendition of the key figures. Limited to a max of 150 cases, Decision 2016 Series 2 is a print-to-order release so the total production could be lower based on the demand. The pre-sale case price is $1,550 direct from the Decision 2016 website. 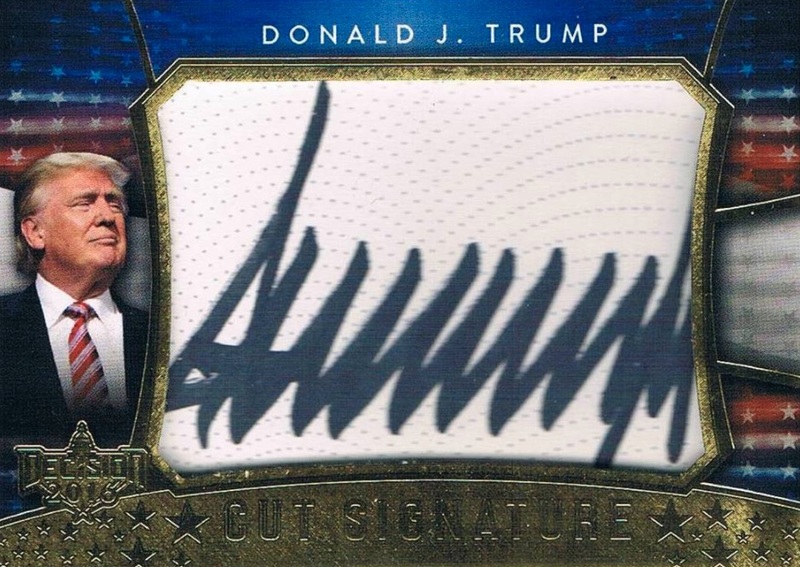 Donald Trump 2016 Decision Signed Autograph Cut Signature Blue Foil Very Rare! 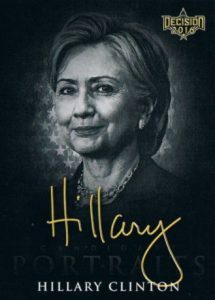 Decision 2016 - Series 2 - Hillary Clinton Sketch - Artist Kong AUTO 1 1 Rare! Applicable parallels will be added when known. 224 Cruz doesn't endorse Trump at Con. 37 cards. Short Prints (SP) noted. 1:4 boxes. 31 cards. Short Prints (SP) noted. 4 per box. 4 cards. All are Super Short Prints (SSP). 29 cards. Short Prints (SP) noted. 1:2 boxes. PARALLEL CARDS: Gold, Green, Red. 20 cards. Short Prints (SP) noted. 1:8 boxes. 26 cards. State on Quarter noted. 1:4 boxes. PARALLEL CARDS: Gold, Blue, Green, Red. 26 cards. Short Prints (SP) noted. 1:4 boxes. 24 cards. 3 per box. TCC14 Huma Abedin alleged ties to "Muslim Brotherhood"
TCC15 "A basket of deplorables"
36 cards. 4 per box. Series 2 looks like a winner. 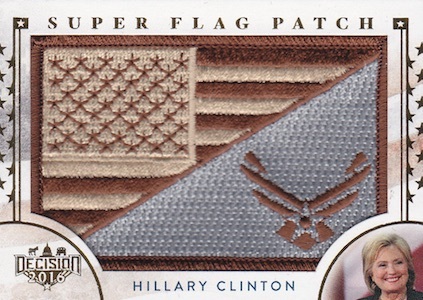 I was hoping for a trade in card for the winner of the presidential race to finalize this historic event. Will such a card be coming? I haven’t found any Letter cards in Series 2. Did any get printed? 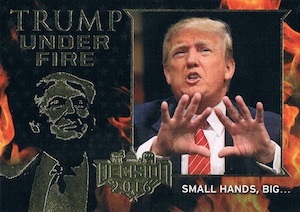 When is the Trump President card coming out? Love the product.